There has been some great stuff coming out of our Seattle-area “alternative” real estate businesses Redfin and Zillow this week that deserve to be mentioned. First up, Redfin came out with a great paper called Seven Tactics for Real Estate Bargaining. Check out their blog post announcing the study here. They analyzed recent sales data from 9,053 single-family-home sales across three markets, including 2,446 in King County, looking for homes that sold for a large discount from the last asking price. Many of the characteristics they identified in homes that sold for a large discount were exactly what you would expect, but it’s great to see some hard data to support your gut instinct when it comes to negotiating a good price on the largest purchase of your life. Sound, data-driven advice for anyone looking to drive a hard bargain in today’s so-called “buyer’s market.” Check out the full report here (pdf). Nearly two out of three homeowners (62%) believe their home’s value has increased or stayed the same over the past year; however, the reality is that 77% of U.S. homes have declined in value. Three out of four (75%) homeowners expect their home’s value will increase or stabilize in the coming 6 months. However, when asked about their local market, 42% think home values in their locality will decrease (compared to the 25% who think this about their own home). So at least 39% of the people are delusional about the value of their own home over the past year, but only 17% are delusional when it comes to the value of their home in the coming year. Hey, at least it seems to show a slight trend toward recognizing reality. 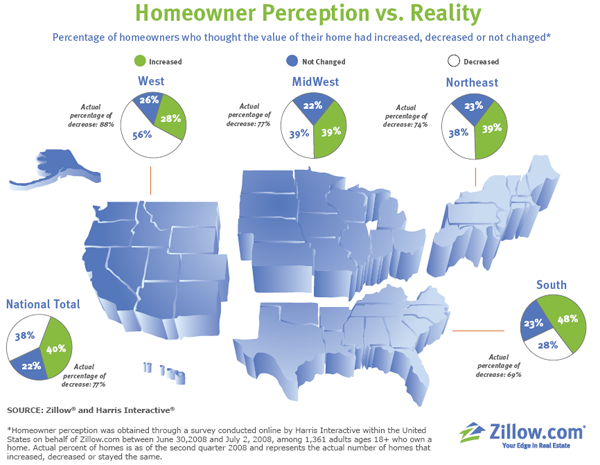 I wasn’t too surprised to read about the disconnect between reality and perception of homeowners with respect to recent housing price trends. I have an acquaintance who purchased a house a short while ago and is a strong supporter of the “real estate always appreciates” theory. He and I used to discuss the affordability of real estate frequently. When I recently mentioned to him that median sales prices in Kitsap County were down 12% from last year he looked surprised, initially. He then shrugged it off with saying that it wasn’t any big deal because prices were up 20% from two years ago to last year. It was obvious that my acquaintance did not know about the recent downward trend in local real estate prices. Maybe it’s part of human nature to filter out, or justify, information that doesn’t agree with what you want to believe. I think that some people really don’t think about it. When they go to sell the house is more than likely when they will begin to think about the local real estate market. I had predicted that home prices would fall by average of 10-20% this year compared to their peak values. While that is certainly true in several areas, I have been surprised at the reluctance of many sellers to face reality and drop their asking prices. Many sellers are still hoping for something close to their peak market value, and if they don’t get it, they just take the house off the market. Most of the houses that are selling now are people who HAVE to sell. However, eventually the market will catch up with the reluctant sellers. Here’s what happens .. let’s say you have 10 similar houses for sale in a neighborhood all asking about $400K, and none of them selling. The people who don’t have to sell, just wait it out and hope. But eventually, one of the 10 becomes desparate because of divorce, layoff, job transfer, etc. and they cut their price until the house finally sells for $350K. That sale then becomes the “comp” for all the other houses in the neighborhood. Even if they are lucky enough to convince somebody to pay close to $400K for their house, they will have trouble getting financing because the house won’t appraise for much more than the most recent comp of $350K. So eventually the market value of that neighborhood is pulled down to reality. This is happening now in many areas due to the normally slow home buying season in the summer. For example, one of our clients just bought a house from Quadrant Homes. It was originally listed for $409K and sat on the market for 4 months. They just got the offer accepted last night for $365K with the seller paying all of their closing costs and prepaid escrows of about $7,500, so their “net price” is only $357,500. I hear these over and over and over and over. The real irony here is that the people who would like to sell (IE those looking to make a quick buck) would actually profit more by selling with a significant price drop and then sitting on the sidelines for a couple years or just plain downsizing. You’re right about what’s going on, of course, but I almost feel sorry for the people who think that if they wait until next spring the storm will pass. Oh, the storm may have passed – but the mess it made will still be there! Home sellers are told by their realitors to repaint, recarpet, landscape, etc to maybe get like 90-95% of last year’s price; but after the realitor’s sweat labor and/or hiring a contractor to get the unit sellable [immaculant], its more like 80-85%? In 2005 you could sell a Seattle fixer as is and still get top dollar; that was then now is now. How many Seattle homes that have been lived in for several years with families would be sellable [immaculant] without massive maintenance costs and/or sweat labor [same thing] costs? 2% and they aren’t for sale? The Zillow study highlights how silly humans can be when trying to distinguish between themselves and what’s going on in the broader environment. For example, when you look at public schools, parents typically think their local school is doing great, and that their kids are getting a fine education. However, when you ask them about the school district or state public schools in general, they think they’re doing a horrible job educating young people. I can’t ell you how much time I’ve spent, as a businessman/economist trying to explain the concept of “sunk costs” to people. It’s so hard for many to understand that the market price is largely independent of investment costs and emotional attachment. When people finally understand that their needs have nothing to do with the value of their home, the pain will set in. Hey Softy, it’s “immaculate” – no offense, just FYI. For Sale Buy Owners are notorious for over pricing their houses. As humans we always tend to value our possessions and our hard work (sweat equity) more than what is realistic. Redfin, an FSBO site highlights the premium at which a home owner associates to the value of their homes. I think it would be interesting to flesh out the underlying psychological reasons for their “7 Tips”. Great comment by Greg Perry @ #7 that really shows the present state of sellers denial and lack of understanding. Immagine a comment like this from a Realtor two years ago! Having a blatant plug for ridfun or zillow doesn´t make the remedial information they provide more important or relevant. Zillow is a fun and harmless site, OK, but at the point the kelman guy went before Congress promoting a business model on the back of tax payer dollars he lost me. The important point for kelman was the right to offer rebates for people to do business with internet based Real Estate companies. In my opinion this practice creates a business model where the internet company does the paper work, then gives you a rebate of commission dollars. It´s a cheap trick. The consumer gets no representation. They get a voice on the telephone and a bunch of smoke with mirrors and our tax dollars were used to promote the concept. At least the pepper says, up front, educate yourself. Once you do you´ll realize you can go it alone with very little risk for a lot less money. Even an attorney gives you something for the money you give them. These other people give you nothing for a very high price. The idea that these people fought for transparency was just a farce. I am still not sure about zillow and their valuation system. The way the zestimate handles sales above and below their previous zestimate seems weird to me in the specific cases I have tracked and all sorts of strange things seem to affect the zestimate for a neighborhood. FWIW, here’s a link to Greg’s earlier post of the 9 buts on the PI blog, with a few (in my opinion) funny comments by the commenters..
David I disagree. I speak for 500 Realty not Red Fin. Our Buyers Agents are FULL SERVICE. They do everything every other Agent does EXCEPT find you the home. We open doors, offer/counter offer, all paperwork, inspections, title/Escrow, and assist as any other Agent would. To help someone find their home is insanity. They have all the same info we have except commission paid and confidential agent remarks(dog sparky in home-dont let out). We just make our money off Lead Generation. So will all Real Estate Companies. Don’t think you can go it alone. We have not worked with 1 Buyer that was able to do it by themselves. Trust me when I say this because we have already worked with highly saavy Buyers from here on the Bubble and elsewhere. none of them could have done it on their own.. NONE! Its ALOT easier and financially more feasible to take 75% of the commission and give 25% of the 3% to another entity. The price you will pay an ATTY to represent you will cost more. Good Luck Buyers attempting to Find Sellers that have their homes listed on the MLS and trying to extract the 3%. Remember they have listing agreements that will pay the SELLING OFFICE 6%. No selling office? Guess who gets it? If there was a Red Fin or 500 Realty back in the early 90’s when I started Buying and Selling I would have NEVER gotten a Real Estate License. Educate yourself YES. But, that means interview who it is your gonna use and what EXACTLY you will be getting. Red Fin is the 2nd best thing to happen to Home Buyers in Washington State. OKOK …We are both tied . I love their money and their research. We at 500 Realty do not mind riding the coat tails of a winner. As for Zillow and Zip. I wish they would already announce their merger and have ZIP step it up a bit from their 20% rebate to 66%. Both companies need each other. Both make no money. Soon all will be profiting from Lead Generation. Its the future of ALL real estate. ZOOM 3-5 years ahead…BANK ON THIS………Most Real Estate Brokerages will have 2 doors in their office. 1 will offer Full Service as we know it at 2-4%. The other side will offer Buyer Rebates to ASSIST their Realtor. They will advertise BUY through us and receive 5000 towards your closing costs. There will be documents that spell out exactly what the Buyer must do to earn this…. We will ALL look back and laugh at the 5-6% people paid. Pure and utter insanity! But gather around…SHHHHHHH …listen closely…75% is hard to beat…When someone comes out with 80% back to Buyer I guarantee their website will be loaded with advertisers and very strong connections to have their Buyers utilize their banks. Those responses contained truth to hilarity. Thanks for bringing it over. Every good listing agent must have good responses to the 9 big buts. Ray, I would have never imagined such a sharp mind lurked in the corners of the Find the Gems marketing strategy. Your grasp of the Real Estate sales business is very correct. I agree that the vast majority of people with Real Estate licenses bring nothing to the table. They simply know a buyer or seller who is naive enough to let them handle the transaction. Most true Real Estate agents will tell you that Real Estate would be a great business if agents had skill. There is a lot of training going on without any working skills required. The lead generation thing was a brilliant point about the business. Most Real Estate training programs are geared toward lead generation. Most web sites, blogs, ads, news letters, and those special insights that Real Estate Professionals offer up are all for lead generation. That´s why we´re here. I also have gotten business and established contacts because of time I spend at the Seattle Bubble. It´s a side benefit to what I have learned here, but it is still a very powerful tool. Where we diverge is that the Real Estate business needs professionals who keep track and pay attention on a daily basis. Some one buying a house that they want is a different animal, but they should also hire some one who understands the business aspects of the purchase and sale. They don´t need to, they can buy the picket fence for any amount they want, but for investment purpose a professional should be consulted. Any way I said too much, but wanted to acknowledge the point that you made. OT: Seattle Flippers In Trouble is live! Not too many in King County yet (189), but I bet the number climbs in the weeks ahead. Thanx Max. Seattle Flippers is now bookmarked on my PC. A $520,000 loss on the first one. Wow! That has got to have some story behind it. There is “Irony” all around. The first being The Tim’s use of anything from Zillow and the fact that all of the Pro-Bubblers remained shockingly silent. Throw a Zestimate up there and suddenly the Bubbleheads become enraged. Then again, it does support their point so of course it is given a free pass. Please allow me to clarify my point with Redfin, which many Bubbleheads use as examples of massive price reductions. The For Sale Buy Owner site has artificially high prices due to the owners over valuation of their own property. These owners often lack the insight that a seasoned professional has and will list a house higher with the hopes of “getting lucky” or because they think their house is actually worth it. It would be interesting to see a side by side comparison of Redfin’s asking price vs selling price and compare it to those listed by real estate professionals. Remember, real estate agents often have to invest money and time to market a house with no guarantee of seeing a return. I have seen many agents turn down listings due to the owners unrealistic expectations for price. Why risk spending hundreds and thousands of dollars marketing a house that will not sell because it is priced too high? It does however back my point that there is opportunity in every market, especially this one. Leverage all of the 7 points to find a great deal. Combine that with low interest rates, and $8500 tax credit, and raised loan limits for conforming loans and you may find a very attractive deal. deejayoh // Aug 8, 2008 at 11:57 am..stated.. The front edge of the hurricane is only beginning to hit Seattle. I did live in Miami for 12 years and certainly experienced my share of hurricanes. The reason that I believe that the edge of the storm is only just hitting us is because many variables. But, from MARKET TICKER blog below, when all banks adjust in ALL regions and return to proper lending standards, Seattle will be especially hit hard by the eye of the storm when all the 2005 – 2007 “vintage” option ARMs reset. Seattle in not one year behind the Tsunami.. it could well be two to three years. Many in Seattle used option ARMs to buy over prized homes vs. their incomes, which they inflated anyway to buy a $900K rambler on Mercer Island, or a $359K one bedroom box in Ballard. Below is the MARKET TICKER comment..
30 (or 15) year fixed term. 20% down in cash, no BS games, no “seller participation”, etc. These standards were developed over time after The Depression because in the 1920s lenders did the same stupid crap that they did this time! They wrote interest-only balloon notes and other forms of exotic financing, which then collapsed when the Ponzi game was no longer able to be maintained by finding a bigger sucker. Harley, I have to say that I don’t understand your complaints about this post. There is “Irony” all around. The first being The Tim’s use of anything from Zillow and the fact that all of the Pro-Bubblers remained shockingly silent. The data in question comes from a survey they commissioned, not individual “Zestimates” of people’s houses. Also, I said right in the post that the survey is “is more entertaining than particularly useful.” Why would it be ironic that people were “shockingly silent” about something described in that manner? Maybe I’m misunderstanding your comment, but it seems like you’re saying that the data in the Redfin study regarding price reductions and homes selling at a discount is skewed by the fact that it comes from data on Redfin transactions. If that’s what you are getting at, you’re mistaken. The Redfin study was based on system-wide MLS data from King County, LA County, and Fairfax County. See page 12 for their methodology. I second what Garth said. I see that you have some townhomes listed. 1303 Hill is a group of townhomes. The previous sales price was for the dirt to build them on. I suspect that there are also some detached homes that were built 2 or more to a lot that originally had only one house. Here’s a few downtown condos for your list…all legit. Thanks, Garth. When “townhomes” are logged as single family, these errors have a way of happening. I’ll see what I can do. I followed a web site called “sacramento flippers in trouble” for a while. Often there was a property at the top of the list that seemed to be for sale at a huge discount from the previous purchase price. In reality, the property had been subdivided and the original building was still viable and was being sold on a tiny lot a fraction the size of what was purchased. I can all but guarantee that the larger discounts on this “seattle flippers in trouble” list are the same deal. I would google the address and find an archive of the listing for the previous sale and I would see the original much larger lot size. When there wasn’t a string of price reductions but rather a single asking price way less than the purchase price then it was 100% true that it was a subdivide. I did this 4 or 5 times. The web site had a comment section where I would point out the facts. No one cared. See for yourself. I’ll bet a dollar to a dime that the same is the case here. Google them. You’ll see…..Oh yeah, I’ll bet no one cares too. The Seattle Flippers site is a bit “buggy”. When I clicked on the first two, multiple listings came up including the one featured on your post. However, unlike Garth, I found that the first one listed was built in 1974, the second was built in 1985, and the third was built in 1986. I did not see anything indicating that the first three were built in 2008. Is this your site? I commend the effort, if it is. The Seattle Flippers site is a bit “buggy”. When I clicked on the first two, multiple listings came up including the one featured on your post. It is my site, so thanks! Unfortunately, MLS numbers are not unique across the Realtor system, so I link to a search URL in case there’s more than one. I did this 4 or 5 times. The web site had a comment section where I would point out the facts. No one cared. Well, you should give it another look. When there’s 1300+ listings, it’s hard to sort out the bad apples. :) Especially when it’s the MLS system that has it wrong. Don’t you resent pulling up condos and “townhomes” in a limited single family home search? Me too. Not sure what you’re getting at. The link you provided is not for any listing on my site… not even close. I actually checked out King County assessor records on 14231 SE Lake Holm Rd. The parcel number is 2221059051 and it is 2.47 acres. The parcel just north of it is number 2221059038 and is 2.29 acres. It was bought in 2006 at the same date, same price, and by the same people who last purchased parcel number 2221059051 (14231 SE Lake Holm Rd). I claim absolutely no expertise at this sort of thing, but the records do suggest that it was subdivided. I’m obviously not as familiar with King County as you guys, but these two addresses aren’t related. Harley- you realize the tax credit you mention is $7500, and is only a loan that must be repaid to the government? Just FYI. I think its main purpose was to make it look like the people were getting something from their government. In practice, I doubt it will have any effect on purchases, as buyers will be needing cash now to close, not future credits that are ethereal to say the least. FWIW, I really like the idea of a Seattle Flippers similar to the one for Sacremento. I would do it if I knew how. Don’t be put off by a little constructive criticism. I was responding to jeff. The link he gave was for a house unrelated to the one he was referring to. Believe me, I’m not put off by criticism. :) I’ve taken quite a bit these last few years since I started these blogs. Since I’m working with imperfect date, the results will never be 100% accurate. I’m especially handicapped when it comes to Seattle, since I’m not from there. My point is that because it stated that “Homeowners were in Denial” it got a pass from the blog. If it had stated “Home owner confidence improving, Lowes and Home Depot revenues likely to increase, as homeowners seek to improve homes.”, it would have been shredded by everyone on here. It just amazes me how people that trash Zillow’s methodology constantly would think any better of it now. Yes Tim, you did say it was “entertaining”, but you did use it in your final conclusion to back up your point. With regard to the Redfin methodology, I was not aware that they took it from the MLS. Thanks for pointing out the methodology. It is a collections of houses “sold for a large discount from the last asking price” which definitely targets one end of the spectrum, but nonetheless I think can be used as a great tool for finding bargains in this market. Yes, but it is interest free over a 15 year period. This is a buyers market so make the seller pay the closing costs!!! Of the first 6 on your list, 5 are development related drops in price according to the info available on the MLS. If you want your site to have credibility, you need to figure out how to filter those out. I can’t see using your info if it’s not credible. I was talking to a friend of mine tonight and he summed it up, “America is on a bender, the truth is lies and honesty is dishonesty…” In other words, we preach the diametric opposite of sound advice as good advice. He’s a personal trainer and I mentioned to him, its not just real estate, its everything; at the gym they tell you dairy products are bad for you, but whey powder [made from dairy products] is good for you. Its like we’ve made misinformation information and information misinformation. A physician told me red wine will not help me, but agreed that red wine had cancer fighting properties. Liberals will tell you to recycle then go back to their McMansion to live anyway. Politicians will tell you they’re for change, then flip flop back to the old way any way. Conservative politicians will preach fiscal government then spend money like drunken sailors. With that being said, I took some additional steps to make sure my data is correct. Also, I completely welcome any comment or criticism on my blog, and if you find any other errors, please let me know. My goal is 100% accuracy. I know that’s impossible, but I will try. I can´t figure out the Max thing. It seems to be a plug for what in my opinion is a bunch of speculation. The assertions may or may not be correct, but it has no basis. A property may not be able to refi again. A sale may net more money. As other people have already pointed out another piece of the property may be sold off, or a transfer for more money may generate a net loss. It makes no difference in my opinion, this is a plug for another website inside of a plug for another couple of websites. What´s that about? Really, Steve? When did you “predict” this? If my memory serves me, you were drinking the Kool Aid not so long ago, right? I could have sworn that you were protesting such a thing as price declines. I’ll have to search the archives. I expect home prices to drop about 10 percent to 20 percent over the next year or so, and then the housing market will flatten out with very little appreciation or depreciation for a few years. He has repeated it a number of times since then as well. You can find the predictions of a number of local agents and “economists” in this post. Thanks, Tim. I seem to remember an exchange between myself and Mr. Tytler regarding his “predictions”. Clearcut Bainbridge was involved as well. I suppose I couldn’t even find it in your archives. Pay your own d*** closing costs. Rolling them into the sale price keeps comps artificially inflated and increases your property taxes. BanteringBear – This may be the thread that you were thinking of. Note that the states that have already been heavily bashed by the subprime mess are not present in the list. Perhaps this is because they have already worked their way through the increasing ARM reset aspect of the downward pricing cycle. Unfortunately, the New York Fed recently took the historical data off its website for the “Dynamic Maps of Nonprime Mortgage Conditions in the United States.” Otherwise, I could do a legitimate data mining analysis and see how subprime exposure is related to price patterns of the cities that crashed and the cities that have held. It would be very interesting to see the future predictions such an analysis would provide. Tim it seems to me you always have positive praise for Steve Tytler. His information is erroneous and you can investigate it yourself. A single sale of a distressed seller will not lower all the prices on a given block of ten homes. Any good appraiser will reference a 13-15% decline in his notes and notate it as distressed. Furthermore predicting a 10-20% drop in the PNW is the most common prediction posted everywhere and on nearly every graph on CNBC, Bloomberg, and mentioned in WSJ. In fact that has been the predictions of many here. You know why? Because they do not know. From my travelling and seeing why home sales are picking up in Florida, Nevada, and Arizona–there is only 1 reason….The homes have dropped 30-50%. These areas will always be the first to recover because TRUE GEMS always get gobbled up. The answer is right in front of you when prices will recover. The foreclosure numbers must decrease q over q. Buyers will continue to purchase distressed properties long before active sellers. 10-20% prediction is sending the wrong message. I suggest Buyers find the homes that are down significantly more then 20% and plan on an additional 15% to equate to about a 33%. I have already seen many homes listed at 499k now 399k. Furthermore my message to Steve Tytler is during this time of distress in the housing industry are you advising ALL your Buyers on the only way to Buy Real Estate that is listed on the MLS? When you are supposed to be acting in the BEST interests of your clients and placing them in the BEST loans do you mention companies like 500 Realty and Red Fin? What do you do when a real estate agent “friend” sends you a client for pre-approval. Do you tell the truth on how they should buy and seek an Agent who will give you the majority of the commission. How can you not? You are an adviser and a professional. Mortgage Reps who do NOT promote Brokerages who give back to the consumer are worthless. We as professionals are supposed to represent our clients and EDUCATE those who DO NOT KNOW. The “hidden secret” is getting more exposed daily . So next time you sit down with your client forget where they came from and EDUCATE THEM. You owe it to your profession! The states that have mortgages that have ARMS that had peaks in 2007 and later what were their precentages of subprime loans? Also from that precent how many will be not be able to afford the adjustment of the loan? Also the states that have been heavily hit such as CA, AZ, FL and NV, what other factors may played into the high foreclosure rates? For example were certain areas hit harder then other areas in the state? For example in California certain areas have been high in foreclosure while others not as much. I think that it is hard to figure what precent of subprime loans within a given state will go into foreclosure? There are so many other factors that can play into this. Also do think that any of these borrows with these subprime loans will be able to benefit from the house bill that passed? Steve Tytler, are you a licensed agent? You cannot, in the State of Washington, legally divulge the details of a purchase contract between buyer and seller prior to closing. It’s a legal issue, not a disclosure issue. Now it´s the Steve Tyler guy with a plug. I think he´s a mortgage person if I remember correctly. I also think he´s supposed to stick to loans rather than involve himself in the Real Estate transaction. Thanks Max, glad to see a FIT in Seattle. LOL @ Tim. Thanks, man, for finding that thread. You see, it’s the wild contradictions from Mr. Tytler which threw me. You know, a large percentage of the delusional sheeple who were in the “prices will never go down” crowd, are now taking credit for predicting his whole bubble. It’s impossibly annoying, to say the least. I wish somebody, somewhere, was archiving all of the nonsense from these industry shills over the course of the past few years, because their credibility is zero, and they need to be held accountable as such. You’re doing a great job, Tim. Since Steve is taking credit for “predicting” these price declines, I feel it’s only fair to include some of his previous quotes as well. People should know the whole story. It’s COMPLETELY obvious that Steve Tytler is one of many industry “professionals” changing his tune as we go along. This sort of waffling reeks. While Steve has apparently had a come to Jesus moment regarding declining prices, none of his predictions can be taken seriously given his track record. Sorry Steve. That Seattle flippers in trouble web site is a bit sad. I know, people should do their research, etc. But there are always these poor saps in every bubble that get in at the end and get stung. And every time the media was their pushing the bubble, we saw it it the dot com and now in housing. But those on that web site are just the obvious losers in this mess. Really all of us pay, pay in tax bail outs, pay in higher prices, etc. When people make money off of speculating on necessities, we all pay, and a few make lots of money. Seems a bit foolish to me, but this is how it is. One of the houses, (406 21st ave Seattle) on the Seattle Flipper site was split into two lots. After the new house was built in back, they are both for sale. Whomever did that still will make money even if he drops the price more. That one alone makes me question the others as there is bias, just like here. Bantering Bear….The last place to ever look for advice on anything r/t future home appreciation or declines is a Mtg Rep. Follow Wall Street and watch where the money is being placed. When the REAL money begins to enter LEN, KBH, CTX, and MTH then give notice. MTH is is up 65% in the last month or two. Did we strike a bottom with the builders?……………The story is still being told. My opinion is no way. Gather around shorts. GEM STOCK TIP………..** Im still long 88k on EGHT** PPS avg at 1.05. I still say to the MOON! No dent.. 15 mill in cash……Come on already…I smell 2.00! I’m not sure of total percentages, but you can see on the map using “loans per 1000 housing units” that, for instance, Washington has about 60% as many subprime loans as the average of CA-AZ-NV-FL. What would be more interesting would be to see how many loans were out in 2004 to present. This would show if the states on my list have caught up to where CA-AZ-NV-FL were at when they started to implode. Unfortunately, the Fed removed to back data from its site. Perhaps “share 90 days + delinquent” provides some indication of this relative to CA-AZ-FL-NV. But other non-map data sources are also available that show how much credit people have taken out, median household incomes etc. I think that is relevant, but since the dynamic map data source is statewide as opposed to city-based, providing a more granular breakdown would not be initially warranted. Most likely, historical value and price history heavily factor into which areas hold their value and which areas plummet. IOW, location, location, location. Since all states have their share of good locations and bad locations, it will average fairly well when ignored. I think this is especially apparent from median price lines that closely match between states. There are so many factors to consider, yet there are only a few main price patterns that account for all 50 states. But the point of a data mining study is to enter all of those factors into a database and run pattern detection algorithms against the data which will show which of these factors most closely correlate to foreclosures. For instance, a high “Median Combined Loan to Value” in conjunction with price declines represents much more risk that owners will walk away than a high number of loans taken out with 20% down payments. That being said, I agree with you that it would be impossible to create a perfect model that would accurately forecast future prices for every city in every state. However, I believe one could get a pretty good idea of the relative risks in each area. Yes, that’s a good point. Market conditions are constantly changing, so what happened last year to CA doesn’t necessarily equate to what happens this year to WA. However, legitimate fundamentals that drive price declines and appreciation will remain fairly constant over time. Thus, figuring out what moves markets and applying this to a particular market would give a good indication of risk of price decline. That doesn’t mean the price will decline. It simply means the risk is higher. For instance, inflation might increase instead of prices going down. This is similar to what you are getting at with your housing bill question. I’m not saying I will do the study, as it would be extremely time consuming, plus the Fed site deleted the core data I would like to use. But I do think the outcome of such a study would be interesting. Fortunately, we do have the next best thing to this study–Global Insight’s housing valuation analysis. Hopefully the quarter 2, 2008 data set is released soon. I would edit the last word of this paragraph to be PRICE, not VALUE. I’m sure you other bubbleheads will understand my point. Bantering Bear – you would enjoy reading Jim Cramer’s ‘The Winners of the New World’ He wrote the article, actually of transcription of a speech he made, on February 29, 2000, The 10 winners were of the dot.bomb variety and then proceeded to lose 98% of their value. Too bad thestreet.com removed said article. It’s also too bad I made a hard copy of it several years ago. In Sept, 2007, another self-ordained investment guru named Chris Whalen assured everyone that Bear Stearns was a safe investment. Sorry to digress from Seattle RE. I hope to find a REAL GEM some day in the Seattle area. Great post. It seems like the best jobs in the world are economics expert/stock market analyst, and weather forecaster. You can be wrong 90% of the time, and people don’t remember that two days down the road. I enjoyed this comment (and the link to the interactive maps. 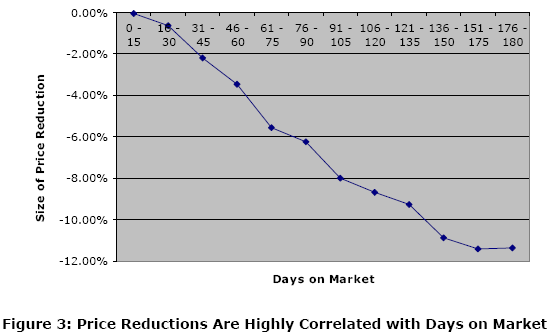 I often say that markets and statistics are many layered. In addition to state by state, city by city, area by area, neighborhood by neighborhood, we also have variances inside the price points (low end, mid priced, high end). …you would enjoy reading Jim Cramer’s ‘The Winners of the New World’… Too bad thestreet.com removed said article. That’s why we have the Internet Wayback Machine. Behold, the original “Winners of the New World” article in all its glory. The level of granularity present that you mention is very interesting. It would be fun to have an interactive map with different levels of drilldown detailing the price history of the categories you mention. I’m surprised companies like Zillow don’t make these maps available. They already have the data, so 95% of the work has already been done. Consumer Reports Sept. issue has an article about bargaining with Realtors for less commission. Re/Max and the independent brokers tend to go lower than others, but all Realtors are subject to coming down on their fee. CS found that those that failed to bargain with their agent often ended up regretting it. The problem I see with this bargaining strategy is it’s still too much like walking into a car dealership. I think customers would be much more satisfied to pay for the actual services received as opposed to averaging the last guy’s good or poor deal in with their deal. Let’s see, the last guy had the agent open 50 doors and then didn’t buy. Now I walk in and only need 3 doors open, and I buy. I end up paying for the other guy’s doors. I get upset and recommend to all my friends that they find an agent who will only charge for the 3 doors they need opened. Eventually, the agent who charged me for opening 53 doors loses out, because the only clients whom will come see him are the ones who need 50+ doors open. Thus, he actually starts making less money per hour than the cut rate agent down the street. It is important to note, this agent didn’t rip anyone off. He opened 53 doors, and he was paid to open 53 doors. But now he is opening 53 doors for every client and only 1/4 of them end up buying, so he is working harder for less money. Thus, adjusting RE company business models to fit the changing environment will ensure buyers and sellers receive high value on their transactions and also ensure the agents that handle these transactions are fairly compensated. Of course the above paragraph is generalized to a specific scenario. Agents who have built good reputations and have repeat clientèle will be more immune to this than the 21-year-old just starting out with his new license and attempting to charge 6%. But it will still have an affect on everybody’s 6%. Jonness…Nice post. We will keep it simple. YOU GET 75% of what we get. But, Go Look first then call us. We do NOT want to get into a sliding scale fee structure. Just know if its on the NWMLS you should hear a CASH REGISTER ring in your head! In the Fall of 2005 I said the housing market was peaking. In the Fall of 2006 I said the housing boom was over and there would be no appreciation in 2007. In the Fall of 2007 I said home prices would fall an average of 10-20% from their peak value (depencing on the neighborhood) and would then remaiin “flat” for several years (i.e. very little appreciation or depreciation). I have also said repeatedly that the Seattle area market will NOT experience widespread home price devlaution of 20%+ as we are seeing in San Diego, Las Vegs, Phoenix, etc. All of my predictions have been published in the Everett Herald where I have been a paid real estate columnist since 1990. You can disagree with my predictions, but don’t accuse me of changing my tune. I was bearish on the local real estate market LONG before anybody else in the “mainstream media” (i.e. local newspapers, TV news, etc.). My only argument with some of the posters on this blog is that many of you are TOO bearish. You keep predicting (hoping) that home values will “crash” in this area by 50% like we are seeing in other parts of the country. I have consistently predicted that will not happen. And I still believe that today. It’s not a hope, it’s not a guess, it’s my analysis based on more than 20 years of studying the Seattle area real estate market. There is a predictable 7-10 year housing cycle. We are currently in the down part of that cycle, which will be followe by a few years of viturally no appreciatiion, which will be followed by another housing boom. In other words, even though I predict declining home values this year and into next year and no appreciation for the next 3-5 years, I still think home prices will take off again. Any house you buy today will be worth more money 10 years from now, even if you paid near peak market value for it. Because even though real estate values fall during the 7-10 year cycle, the overall trend is always up. If buy real estate for the LONG TERM (10 year or more), you are almost guaranteed to make a profit when you sell. Short-term “flipping” only works if you are lucky enough to get in and out of the market at the right time. Real estate professionals can do it, I’ve done it a few times myself, but the average person gets in too late and they get stuck with a property that costs them hundreds of dollars per month to hold while they wait for market appreciation to bail them out. That is not “investing” it is “speculating” and just like oil speculators who bet that oil prices would keep going up past $140 per barell, often you lose when you get into the market too late. I’m impressed with your predictions coming true so far, but the fact is we really don’t know what is going to happen in 10 years. We could have 2 years of a falling market and then a flat market for another 7 years. We know the upside on this last cycle was unprecedented. What we don’t know is: What is going to happen in the local and global economy over the next 2-10 years? It looks like Canada has overtaken the U.S. from a quality of life and overall wealth… interesting article, probably worth a discussion. I was able to use it recently when I refinanced and guessed the value the assessor came up with to within a few hundred so that it didn’t slow down the process of getting the loan together. You just have to be willing to face reality and look at all the comp sales in the area to determine if your zillow price is high or low, but at the very least it gives you a starting point. Personally, I think it is very similar to the last housing boom of 1989-90 when housing prices doubled in 2-3 years. That boom was followed by a 10-20% pull back and several flat years of virutally no appreciation. I think that we will see basically the same thing this time around. Hence my predictions. Now, no two housing boom/busts cycles are EXACTLY alike … so it’s impossible to predict with 100% certainty what will happen. There are two “wild cards” in this housing boom/bust and that is subprime mortgage boom. That is a new development that we did not have in previous housing booms. 20% of those loans are in default. Big surprise, huh? I believe that most of those borrowers will go into foreclosure this year and next because they can’t keep making the mortgage payments forever. So the worst will be over by the end of next year in terms of foreclosures. There will always be foreclosures .. they exisit in any market .. but the peak in the number of foreclosures shuld occur this year and/or next year… then they will start droppping back to normal levels. As with home prices, I do NOT believe that the foreclosure rate in the Puget Sound region will come anywhere close to the rate we are currently seeing in California, Nevada, Arizona and Florida. Those areas always have bigger housing boom/bust cycles than us and they also have bigger foreclosure “booms” than we do. So the crux of the argument is whether the current housing cycel is truly unprecedented .. or will it be similar to previous housing cycles. Many of this blog believe we are in uncharted territory. I think this housing “bust” could be a litte more severe than the last one, but nowhere near as bad as areas like San Diego. Because I have seen this all before. Contrary to popular belief, the housing market is not totally dead. It is slow, but now dead. I have mortgage clients who are literally buying houses every day. I had one client buy a house last Friday and another one is making an offer on a house today. So there is a market out there. Sellers just have to adjust their asking prices to the new reality. Sorry, I need to proof my posts before I hit submit .. please ignore the typos. Today, mortgage rates are about 1.5% above the lows, so that affects affordability. But as I said, peoople are still buying homes. It will just take time for the excess inventory of houses for sale to work out of the market. One thing we know in the next 10 years is half of the 78 Million baby boomers are going to be retiring and we will need to replace their jobs. Thoughts of retirement are probably wishful thinking on the parts of many of those baby boomers, Harley. Forecasts I have seen suggest a good portion of them (half) are going to have to work well beyond the typical age of retirement in order to make it because they have very low savings. Consumers 45 years and older are raiding or compromising their 401(k) accounts, shirking monthly payments and skipping regular medications and doctor visits at an alarming rate, according to the American Association of Retired Persons. As many as 25% of Americans from the ages of 45 to 64 said they are taking these steps to stay financially afloat, the AARP found in a recent study. That puts them at a decided disadvantage when retirement rolls around, particularly if they have subverted their health, and may lead to putting that retirement on hold. I think those forecast models assume behavior of this generation will look like past generations. I don’t think that will come to pass. And that’s speaking as a boomer. here is an article stating mid 09 is good time to think of buying a house – with respect to higher interest rates.. But, Steve Tytler you never addressed my question? Do you as a Mortgage professional and a columnist educate ALL your Buyers on HOW TO BUY REAL ESTATE in 2008 forward? Do you write and tell the masses that with a little effort on their part they can earn nearly all the commission? When you get leads from Realtors do you advise “their” clients that with a little effort they can reduce nearly all of the amount of money needed to close? I suspect you DO NOT. You are not a Professional in any profession when you do NOT disclose what you know. If you do not KNOW then you are also not a Professional due to not keeping up on what is truly happening in your Profession. Your guessing of tops and bottoms is insanity. Every deal is it s own entity. With all the knowledge behind Tim he may still end up buying too high. You may get one at 10% off or 50%. True DD in your purchase will equate to the purchase of a GEM. I ask you as I ask ALL Mtg Rep’s. Are you EDUCATING YOUR CLIENTS? I suspect not. Your loyalties are sorely misplaced. Furthermore, I state this. A mortgage Rep without a 500 Realty, Red Fin, Iggy’s, MLS 4 Owners, Shop Prop, icon on their website or a linked story on how to Buy has no place in advising anything about Mtg loans and whats the Best for the consumer. When I open our Mortgage Company (which is coming) the website would be littered with all the contemporary companies that educate the consumer and place money in their pocket. Every company would be listed. It doesn’t matter who your clients use. It only matters that YOU REPS EDUCATE that there is an option. Steve I took the time to dig into your website. Glad to see you give 50% back to the buyer. I’m happy you are part of the change. What if they decide to use an alternative Lender? I assume that will not effect the 50% deal…..I hope…. Do you not see the enormous difference between “flat for the next few years”, and “fall by an average of 10-20% this year”? Give it up, Steve. You can’t BS your way out of this one. Hey, I can extract unlimmited Zillow searches to a spreadsheet if anyone is interested. Rogie3@yahoo.com. I will do the searches and am not going to sell the program that I have written. I can also do whitepages and searchbug on those properties if you want.